This is a quick visual guide to all PS4 Pro games enhanced over standard PS4. After this introduction, the first list is games which have been programmed specifically to take advantage of the new hardware, at release or with post-release patching. The next list covers VR games with enhancements; some titles with multiple display modes appear again here. The final list covers unpatched games which are enhanced by the Boost Mode available from Pro's console settings. Note that this list is far less comprehensive than the preceding ones. Almost every game without official support should be helped by Boost Mode, but only those specifically examined are shown here. There should be hundreds (if not thousands) more with benefits. Most games with high-res modes automatically supersample when played on a 1080p screen, but not all. Modes marked with a green checkmark automatically supersample. 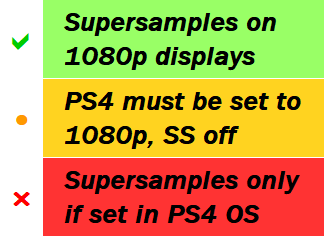 Modes marked with a red X must be forced to supersample on a 1080p display, using the "Supersampling" toggle in the PS4 console settings. Modes marked with an orange dot will be used on a 1080p display when that setting is turned off. To use orange dot modes on a 4K display, the PS4 console settings must also be changed to output 1080p. All high-resolution VR games downsample in the helmet display. Effects, resolution, and framerate in Pro modes are color coded versus standard PS4. White indicates essentially no change. Red is worse, orange is arguably better or worse depending on personal preference, and green is definitely better. Sometimes the exact same text might be listed, but the block colored in anyway. This means both modes have the same target, but Pro meets the target more often (green) or less often (red). Games using CBR have their resolutions listed as e.g. 2160c. Standard rendering is listed as e.g. 2160p. Two other methods are listed: temporal accumulation types similar to CBR as e.g. 2160t, and geometry rendering--where only polygons are more detailed and textures are unimproved--as e.g. 2160g. (Note that neither CBR nor any others of these are types of upscaling. Additional upscaling to 4K is still necessary if the resolution is below 2160.) If you're unclear on any details, just post a question in the thread and I'll attempt to answer. Games that support HDR are tagged to the right of their title bar in the list. There's also a summary in Table 1 below. Both PS4 models can output HDR. However, only a very few 1080p displays can show the effect. A 4K display is therefore usually needed to see HDR, even if the attached console is a standard PS4. Only one game, Sniper Ghost Warrior 3, is known to have HDR but no official Pro support. Games are listed in alphabetical order by title. I use the full official names: Tom Clancy's The Division versus The Division, Middle-Earth: Shadow of Mordor versus Shadow of Mordor, etc. For this reason, as well as the ever-expanding nature of this list, searching may be necessary. Simply use your browser's "search in page" function, which should bring you to the appropriate game block. Please keep two things in mind: first, games with both flat and VR modes may appear in both lists. Second, if you have opened the "spoiler" to show the update log in the first post, search will probably also stop there. Boost Mode opens a portion of the Pro's extra power to all games. Thus, games without official support can get enhanced anyway. (Boost Mode does not have any effect on games with official Pro support.) As noted at the start, the list is only a sample. 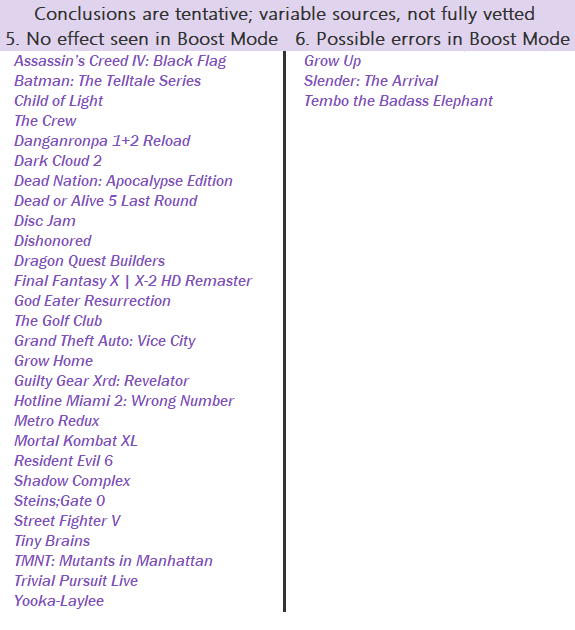 Unlike the other lists, there are surely hundreds of other titles improved by Boost Mode that aren't shown here. More impressions and screenshots would be appreciated! The games that Boost Mode affects have smaller benefits, and I can't research them as thoroughly. Since their boosting wasn't planned, they can't rise above the limits of the standard game. Therefore, some well-performing games may simply not be visibly affected at all. These are listed in the Statistics section below, in Table 5. In rare cases, problems with framerate, graphics, game logic, or program stability could be introduced. Reports of these are listed in Table 6. For all these reasons, Boost Mode is separate and uses a different color scheme. Yes, loading times are improved over standard PS4 hardware. A better drive interface means all games see shorter load times, even if they don't have official support, and even if Boost Mode is turned off. Boosted games, or ones with official support, can have further load time reductions on top of the universal improvement. Because games and hard drives vary, so does the size of the benefits. Along with lack of extensive testing, this is why shortened loading times aren't explicitly stated below. But they are present in almost every game. The majority of games have better framerates on Pro versus standard PS4, but only a few raise the target framerate by 30fps. The overall graphical power difference, as well as the presence of bottlenecks not addressed by the new hardware, make such a change in performance uncommon. The games that do, either across the board or in specific modes (including VR), can be found in the Statistics section below, in Table 2. Games are only included in the main lists if I can find proof of specific improvements. That includes analysis by me, or by others across the web. Developers often announce Pro support without any details, and it's possible for enhancement plans to change or be delayed. Or, some games may actually be improved but evidence isn't easy to obtain. In the Statistics section below, Table 3 lists titles that have been claimed, but not fully analyzed due to lack of material. If you post links or screenshots I'll try to check them. Table 4 lists titles that have been claimed and analyzed, but for which I found no improvements. Since I could be mistaken, please feel free to post contrary impressions, screens, and analysis. Some entries on this list are incomplete, and the whole thing is necessarily a work in progress. (The VR section is especially spotty. Since the social screen output isn't necessarily related to the headset view, they often can't be easily analyzed.) If you can supply material on unlisted games yourself, screenshots should be at 4K size to allow pixel counting (even if the game is running at 1080p). If you know where they're up elsewhere, please feel free to post the links. Thanks in advance! Spoiler: Changelog hidden to reduce clutter. Click here to show. 12/11 - Initial posting, followed by changes based on research. Added Helldivers, Trackmania Turbo (and VR), (VR) Super Stardust Ultra VR. 12/12 - Made changes based on research. Added , Darksiders, Knack, Mafia III, Planetside 2, Sword Art Online, World of Final Fantasy, (VR) Catlateral Damage, two Hatsune Miku games, How We Soar. Removed (VR) The Assembly, Sports Bar VR, Tumble VR. 12/13 - Made changes based on research. Added ARK, Arkham Asylum, Oxenfree. 12/14 - Made changes based on research. 12/15 - Made changes based on research. Added Wheels of Aurelia, Yakuza 6. 12/17 - Made changes based on research. Added Mount & Blade. 12/18 - Made changes based on research. 12/20 - Made changes based on research. Added Berserk, The Division. 12/22 - Made changes based on research. Added Neon Chrome, Ride 2, RIVE, (VR) Job Simulator. 12/26 - Made changes based on research. 12/27 - Made changes based on research. Added Sports Bar VR. 01/03 - Made changes based on research. 01/04 - Made changes based on research. Added Diablo III. 01/10 - Made changes based on research. Added LEGO Harry Potter. 01/11 - Made changes based on research. Added King of Fighters XIV. Removed World of Final Fantasy. 01/17 - Made changes based on research. Added Amnesia Collection, Kingdom Hearts HD II.8. 01/22 - Made changes based on research. Added Battleborn, Gravity Rush 2, Rez Infinite (and VR). 01/23 - Made changes based on research. Added Resident Evil VII (and VR). 01/24 - Made changes based on research. 01/29 - Made changes based on research. Added Trove. 02/02 - Made changes based on research. 02/06 - Made changes based on research. Added Don Bradman Cricket, Nioh. 02/09 - Made changes based on research. Added Fallout 4. 02/12 - Made changes based on research. Added Warframe, (VR) Perfect. 02/14 - Made changes based on research. Added Sniper Elite 4. 02/18 - Made changes based on research. Added RESOGUN, (VR) DiRT Rally. 02/19 - Made changes based on research. Added For Honor, Mother Russia Bleeds. 02/21 - Made changes based on research. Added Here They Lie (and VR), Rocket League. 02/25 - Made changes based on research. Added Party Golf. 02/27 - Made changes based on research. Added Horizon Zero Dawn. 03/02 - Made changes based on research. Added The Assembly (and VR). 03/06 - Made changes based on research. Added Homefront: The Revolution, NieR: Automata. 03/07 - Made changes based on research. Added Incredible Adventures of Van Helsing, Ghost Recon Wildlands, Torment. 03/08 - Added Boost Mode game list. Made changes based on research. Added forma.8, No Man's Sky. 03/10 - Made changes based on research. Added (Boost) 7 Days to Die, Carmageddon, Dead Island Definitive, DOAX 3, DiRT Rally, Dynasty Warriors 8, Far Cry 4, Ginger, God of War 3, I Am Bread, Mekazoo, Shadow of the Beast, SAO Hollow Fragment, Super Robot Wars V, Tales of Berseria, The Tomorrow Children, Tony Hawk 5, UFC 2, WRC 6, WWE 2K17. 03/11 - Made changes based on research. Added (Boost) 3on3 Freestyle, Alienation, COD: Advanced Warfare, Costume Quest 2, Dead Rising, DR2: Off the Record, Dishonored, DOOM, DQ Heroes II, Everybody's Gone to the Rapture, Far Cry Primal, Figureheads, GUNS UP!, Lichdom Battlemage, MGS V, Moe Moe WWII 3, PvZ Garden Warfare, Resident Evil Origins, Saint Seiya Soldier's Soul, Sky Force Anniversary, Tearaway Unfolded. 03/14 - Made changes based on research. Added (Boost) Albedo, Borderlands, Devil May Cry 4, DmC, Ether One, [email protected] Platinum Stars, LEGO Dimensions, Madden NFL 16, Need for Speed, NHL 17, Rise of the Kasai, Rogue Galaxy, Trials Fusion, TRON RUN/r. 03/15 - Made changes based on research. Added (Boost) Bladestorm, The Mark of Kri, Senran Kagura: Estival Versus. 03/18 - Made changes based on research. Added A King's Tale, Senran Kagura: PBS, (Boost) Styx: Shards of Darkness. 03/21 - Made changes based on research. Added Flatout 4, Mass Effect: Andromeda, (VR) HoloBall, The [email protected] VR, Summer Lesson, (Boost) Battle Islands, The Crew, Emily Wants to Play, Hawken, Minecraft, MXGP 2, The Order 1886, Zombi. 03/27 - Made changes based on research. Added Dark Souls III (from Boost), Kingdom Hearts I.5 + II.5, Kona, MLB The Show 17, Verdun, Vikings, (Boost) Battle Ages, Duke Nukem 3D, GTA III, Uncharted Collection. 04/02 - Made changes based on research. Added Snake Pass, (VR) Korix, (Boost) APB Reloaded, DEX, LUMO, Persona 5, Walking Dead: A New Frontier. 04/11 - Made changes based on research. Added Bulletstorm, PaRappa, Skyforge, Tethered, (VR) Starblood Arena, (Boost) Air Conflicts: Secret Wars, Croixleur Sigma, Gauntlet: Slayer Edition, Hard Reset Redux, Kholat, LEGO City Undercover, Oneechanbara Z2 Chaos, Psychonauts, Red Goddess, Rory McIlroy Golf, Virginia. 04/17 - Made changes based on research. Added (Boost) Naruto: UNS 4, Valiant Hearts. 04/29 - Made changes based on research. Added Full Throttle, Little Nightmares, Outlast 2, What Remains of Edith Finch, (VR) Bandit Six, Statik, (Boost) Aaero, Minecraft Story Mode, Sniper: Ghost Warrior 3, Syberia 3. 05/16 - Made changes based on research. Added Injustice 2, LocoRoco, The Surge, (Boost) Defense Grid 2, Risen 3: Titan Lords, Wolfenstein: The Old Blood. 05/28 - Made changes based on research. Added War Thunder (from Boost), Dreamfall Chapters, Human: Fall Flat, LEGO Worlds, Polybius, Portal Knights, RiME, Samurai Warriors: Spirit of Sanada, (VR) DOAX 3: VR Paradise, Farpoint, Moonshot Galaxy. 06/04 - Made changes based on research. Added Danger Zone, Prey. Tekken 7, Victor Vran, (VR) Star Trek Bridge Crew. 06/06 - Made changes based on research. Added DiRT 4, The Dwarves, wipEout Omega, (Boost) flower, Knights of Valour, We Are the Dwarves. 06/20 - Made changes based on research. Added Final Fantasy XIV (from Boost), MotoGP 17, Nex Machina, Paladins, Tinertia, The Town of Light, The Witch and the Hundred Knight 2. 06/25 - Made changes based on research. Added Atelier Firis, BlazBlue: Central Fiction, Chess Ultra (and VR), Get Even, Moto Racer 4 (and VR), Plague Road, School Girl Zombie Hunter, Thea: The Awakening, (VR) Crystal Rift, Symphony of the Machine, (Boost) Crossout, God Eater Resurrection, Life is Strange, Madden NFL 17, Seasons After Fall, Sebastien Loeb Rally Evo, Spy Chameleon. 07/07 - Made changes based on research. Added Crash Bandicoot N»Sane Trilogy, Elite Dangerous, Final Fantasy XII, (VR) Arizona Sunshine, (Boost) Marvel Heroes Omega. 07/18 - Made changes based on research. Added (VR) Fantastic Contraption. 07/27 - Made changes based on research. Added Infinite Minigolf (also VR), Pyre, (VR) Mortal Blitz, SUPERHOT VR, (Boost) Game of Thrones by Tell Tale, Megadimension Neptunia V II, Motorcycle Club. 08/08 - Made changes based on research. Added Dragon Quest XI, Dreadnought, Fortnite, Hellblade, Incredible Adventures of Van Helsing II, LawBreakers, Patapon Remastered, Shadow Tactics, Sine Mora EX. 08/25 - Made changes based on research. Added Agents of Mayhem, Bard's Tale Remastered, F1 2017, Madden NFL 18, Matterfall, Sonic Mania, Sudden Strike 4, Uncharted: The Lost Legacy. 09/06 - Made changes based on research. Added Destiny 2, Everybody's Golf, Knack 2, Legend of Heroes: Trails of Cold Steel III, One Piece: Unlimited World Red, Redout, This is the Police, X-Morph: Defense, (Boost) Dead Alliance, Pillars of Eternity, Resident Evil: Revelations, Yakuza Kiwami. 09/10 - Made changes based on research. Added Life is Strange: Before the Storm, XCOM 2 (finally!). 09/14 - Made changes based on research. Added Cities: Skylines, A Hole New World, NBA 2K18, NBA Live 18, NHL 18, PES 2018, (Boost) Baja: Edge of Control, Dead By Daylight, Heavy Rain, NFS Rivals, Prototype Biohazard Bundle, The Wolf Among Us. 09/20 - Made changes based on research. Added Burly Men at Sea, MvC Infinite, Project CARS 2, Raiders of the Broken Planet, (VR) End Space, (Boost) Warframe (from Support). 09/28 - Made changes based on research. Added Danganronpa V3, FIFA 18, Ys VIII, (Boost) RUINER. 10/05 - Altered official support list format to more clearly identify HDR titles. Made changes based on research. Added Dishonored: Death of the Outsider, Dragon's Dogma, EVE: Valkyrie - Warzone, theHunter, The Last of Us: Left Behind, The Witcher III (from Boost). 10/10 - Made changes based on research. Added Blue Reflection, Shadow of War, WRC 7. 10/12 - Made changes based on research. Added (VR) Psychonauts, Sparc, Tumble VR. 10/16 - Made changes based on research. Added Don't Knock Twice (and VR), Gran Turismo Sport. 10/26 - Made changes based on research. Added AC Origins, Race the Sun (and VR), South Park: The Fractured But Whole, Wolfenstein II, (VR) The Bellows, Gran Turismo Sport, (Boost) DB Xenoverse 2, The Evil Within 2, SOMA. 10/31 - The ResetEra begins. 11/02 - Reformatted to clean up footnotes, and clarified downsampling tags. Made changes based on research. Added Metal Gear Solid V (from Boost), WWE 2K18. 11/06 - Made changes based on research. Added Call of Duty: WWII, World of Final Fantasy. 11/08 - Made changes based on research. Added .hack//G.U., The Solus Project (and VR), (VR) Paranormal Activity. 11/12 - Made changes based on research. Added The Evil Within 2 (from Boost), (Boost) Dynasty Warriors Online Z, Monster Hunter Frontier Z, Phantasy Star Online 2, Tales of Zestiria, Yakuza Ishin. 11/17 - Made changes based on research. Added L.A. Noire, Star Wars Battlefront II. 11/27 - Made changes based on research. Added Birthdays: The Beginning, Hatsune Miku Future Tone, Megaton Rainfall (and VR), MudRunner, Need for Speed: Payback, Nidhogg II, (VR) Skyrim VR, Monster of the Deep: FF XV. 12/06 - Made changes based on research. Added Star Ocean: The Last Hope. 12/30 - Reformatted to clarify downsampling, and improve readability for readers with color deficiency. Made changes based on research. Added Hidden Agenda, LocoRoco 2, (VR) Raw Data, Ultrawings. 01/31 - Made changes based on research. Added Dragon Ball FighterZ, Dragon Quest Heroes II (from Boost), Monster Hunter World, Tiny Metal, UFC 3. 02/13 - Made changes based on research. Added Dissidia NT, Iconoclasts, Marooners, Shadow of the Colossus, Wulverblade. 02/18 - Made changes based on research. Added Dynasty Warriors 9, Fe, Kingdom Come: Deliverance, Monster Energy Supercross, Secret of Mana, (VR) DOOM VFR, The Inpatient. 02/21 - Made changes based on research. Added Ashes Cricket, Metal Gear Survive, Tokyo Xanadu eX+, (VR) Apex Construct, The Persistence. 03/11 - Reformatted to clarify new supersampling options. Made changes based on research. Added Bridge Constructor Portal, Gravel, Tera, TT Isle of Man, (VR) Cold Iron, Moss. 03/21 - Made changes based on research. Added Burnout Paradise, Pure Farming 2018, Surviving Mars, (VR) Apollo 11 VR, Floor Plan. 04/02 - Made changes based on research. Added Assassin's Creed Rogue, DOOM (from Boost), ELEX, Far Cry 5, Malicious Fallen, MLB The Show 18, Ni no Kuni II, A Way Out, (VR) wipEout Omega Collection. 04/08 - Made changes based on research. Added Attack on Titan 2, Dead Rising 4, Immortal Redneck, Infernium, Warriors All-Stars. 05/13 - Made changes based on research. Added AereA, AO International Tennis, Battlezone, City of Brass, God of War, Super Mega Baseball 2. 05/21 - Made changes based on research. Added Conan Exiles, de Blob 2, Dragon's Crown Pro, Horizon Chase Turbo, Railway Empire, Tacoma. 06/04 - Made changes based on research. Added Dark Souls, Detroit, Far Cry 3, H1Z1 Battle Royale, Subaeria, Tennis World Tour, (VR) Along Together, Out of Ammo. 06/18 - Made changes based on research. Added ONRUSH, Riddled Corpses EX, Shaq Fu, Sky Force Reloaded, Rainbow Six Siege (from Boost), Unravel Two. 07/01 - Made changes based on research. Added The Crew 2, EVERSPACE, Fighting EX Layer, Jurassic World Evolution, Lumines Remastered, Okami HD. 07/26 - Made changes based on research. Added 20XX, Danger Zone 2, Dark Rose Valkyrie, Earthfall, Energy Invasion, Far Cry 5: Hours of Darkness and Lost on Mars, Hungry Shark World, Ikaruga, The Mooseman, Red Faction: Guerrilla Re-Mars-tered, Tempest 4000, Warhammer: The End Times - Vermintide. 08/28 - Made changes based on research. Added Brawlout, Candleman, F1 2018, Guacamelee! 2, Hero Defense, Madden NFL 19, PES 2019, State of Mind, Tesla vs. Lovecraft, Warhammer 40,000: Inquisitor - Martyr, We Happy Few. 09/14 - Made changes based on research. Added Black Clover, Claybook, Construction Simulator 2, Divinity: Original Sin II, Donut County, Far Cry 5: DLZ, NBA 2K19, NBA Live 19, NHL 19, Shadow of the Tomb Raider, Shenmue I & II, The Sims 4, Spider-Man, Strange Brigade, V-Rally 4, The Walking Dead: The Final Season, Warface, Yakuza Kiwami 2, ZOE - The 2nd Runner, (VR) Bow to Blood, Catch & Release. 09/28 - Made changes based on research. Added Animal Super Squad, The Cat and the Coup, FIFA 19, The Gardens Between, The Golf Club 2019, Hover, SNK Heroines, This is the Police II. 10/03 - Made changes based on research. Added Air Conflict: Secret Wars (from Boost), Assassin's Creed Odyssey, Atelier Lydie & Suelle, ATV Drift & Tricks, Dungeons III, MotoGP 18, MXGP Pro, Real Farm, Space Hulk: Deathwing, (VR) ATV Drift & Tricks. 10/12 - Made changes based on research. Added CoD: Black Ops IIII, Megadimension Neptunia VIIR, Megaman 11, WWE 2K19, (VR) Astro Bot Rescue Mission, Downward Spiral, VRFC, ZOE - The 2nd Runner. 10/21 - Made changes based on research. Added Agony, Anamorphine (and VR), Captain Spirit, Hand of Fate 2, Mark of the Ninja, Old Man's Journey, Starlink: Battle for Atlas. 10/29 - Made changes based on research. Added Labyrinth of Refrain, Red Dead Redemption II, Soul Calibur VI, Warriors Orochi 4. 11/10 - Made changes based on research. Added The Forest, Hitman 2, Resonance of Fate, SkyTime, Tetris Effect (and VR). 11/17 - Made changes based on research. Added Battlefield V, Fallout 76, Spyro Reignited Trilogy. 12/03 - Made changes based on research. Added Darksiders II, LEGO DC Super-Villains, Ride 3, The Spectrum Retreat, (VR) Beat Saber, Starbear: Taxi. 12/07 - Made changes based on research. Added Darksiders III, GRIP: Combat Racing, Just Cause 4, Mutant: Year Zero, Poi, Subnautica. 01/23 - Made changes based on research. Added Ace Combat 7, EDF 5, Farming Simulator 19, Hitman HD Enhanced Collection, PUBG, Scintillatron 4096, Smoke and Sacrifice, Tales of Vesperia, Vane, Warhammer: Vermintide II, (VR) Firewall: Zero Hour, Red Matter. Here is the list I've compiled of all games with PS4 Pro enhancements, whether from official support or Boost Mode. It has been rewritten and changed since its last home, so please read the FAQ or ask questions in the thread and I'll do my best to answer. I'm aware that the footnotes are pretty awful right now. I've been trying to develop a method that'll work effectively on both desktop and mobile; as you can see, I've been very unsuccessful. I sincerely apologize for the terrible implementation, which I will not be able to address until tomorrow. There may well be other things broken or unclear. Please let me know if you have any issues or suggestions. Thanks so much. Thank you for all the hard work keeping this updated! Wow! This list will be very helpful! Excellent work, thanks! Can't see a single image. Is Resetera still having issues with some image hosting sites? This list has been an incredible asset since the Pro launched OT - so grateful to have you here. After finally getting a Pro hopefully I can play some games and contribute in time. You’re the best! Yaaay, the thread this forum needed! :D Thanks for your work Liabe and thanks to everyone else collecting all the info, also in the old thread. Great to see you here Liabe! Is anyone else missing pictures? I have no problem with abload either on my PC or my phone. Note that ResetEra seems to be doing some sort of live loading, so images appear and disappear as you scroll through the lists. It's not ideal, but there's nothing I can do about that. awesome! this thread was such a great resource at that "other" place. glad you've got it ported over. There we go again. This thread is soo good, sony should pay for the work you guys put in. Lia, this is some insane work! Thank you for your time and effort. Honestly, this is impressive. Glad to see these two invaluable resources of ERA (both Liabe and this thread). No news about Evil Within 2? last i read they working on it! Just posting to say that Metal Gear Solid V (both Phantom Pain and Ground Zeroes) got patches for a res bump. If you're running the game on a 4K display, the resolution is bumped to 1440p, as well as more stable 60FPS framerate. There is no downsampling for 1080p display users, however the framerate is now even more stable at 1080p60. If you have the Definitive Edition version of Ground Zeroes, you will get the patch. Not stand alone versions that released back in 2014 however. This is the thread I've been hoping for the most. Glad to see it again. Bookmarked. Great thread. And the hard work is very much appreciated OP. Wonderful thread. Great resource for a Pro owner and a neat thing to point the doubters towards. One thing I always wondered though is why images when a text chart would do just fine (and require less work/space)? The amount of bandwidth this thread will take up by the end of the gen is, well the thought is quite scary. Thank you for this thread OP. Much appreciated. Hope Capcom will be adding Pro support for SFV Arcade edition. Thanks for this thread Brave! For information about Pro games, this has always been my bible. Bravo Liabe. Are we sure Assassin's Creed Origins go all the way up to 2160p ? Correct me if I'm wrong. BTW, it is really good to see you here ! I just wanted to thank you for all your work and the fact that you decided to continue it on ResetEra. I used to be a lurker on NeoGAF and your thread was one of my favourites. Now I can follow it like a normal user, yippee! I always thought this thread had some incredible effort put into, back on the old site. Thank you for all your work! So glad you moved over Liabe! One of the best and most informative threads on the old site! Nice. Glad to see this thread here. Thank you so much for this Liabe! I appreciate the hard work. Thanks for keeping this thread going and for all the hard work you've done and continue to do. It's been such a great resource.